Hello! How have you been? I’ve missed you 😉 Life has been busy … insanely busy at times. Time just slips by and before you know it … almost two months have passed without writing a single blog post … you find two jars of lemon curd in the cabinet that have reached their expiration date and a tube of sugar cookie dough in the back of your refrigerator that has also reached its expiration date … slightly embarrassing, but not enough to stop you from making Lemon Curd Cheesecake Bars! Regarding the title of this post … life has given us some lemons … some are on the tree in my yard and some not. First, the recipe … then I’ll try to explain what’s been goin’ on. These cheesecake bars are a variation of my Blueberry Cheesecake Bars with Sugar Cookie Crust, with a few adjustments. 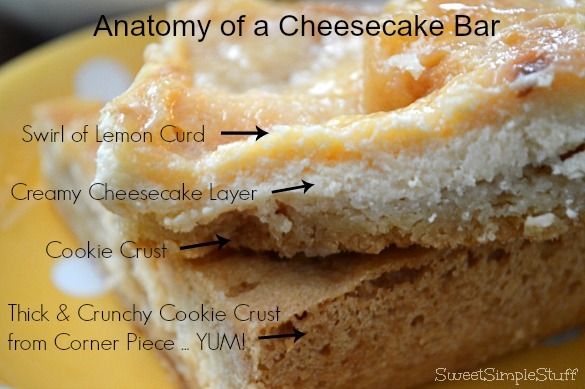 I upped the cheesecake filling … yippee, more cheesecake! 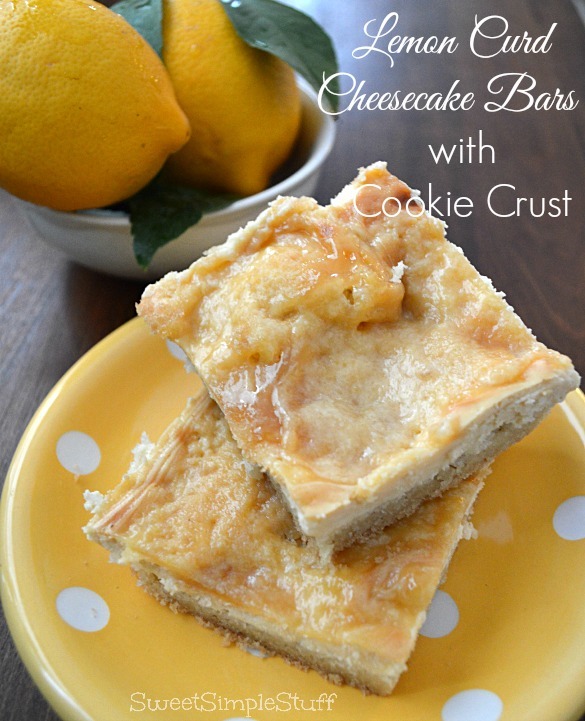 I can’t believe that I didn’t think of making a lemon variety of these bars sooner! You could make your own lemon curd, but the ready-made curd is sooo good and sooo easy … used one of the jars from my pantry. Your bars will be a prettier color than mine … no brown spots … you will be smarter than me … you won’t turn the oven temp up (and on convention roast) to hurry up and put the pork roast for dinner in the oven 😉 Once again … learn from my mistakes. However … lemon cheesecake bars were amazingly delicious … brown spots and all! 1. Press the cookie dough evenly in a greased 9″ x 13″ baking pan. 2. In a small mixing bowl, beat cream cheese and sugar. Add egg and beat until smooth. 3. Spread the cream cheese mixture over cookie dough. 4. Use a spoon to dollop the lemon curd on the cheese mixture. 5. Using a knife, swirl the lemon curd and cream cheese mixture (like you were making a marble cake). 6. Bake at 350° for 35 minutes or until edges of crust are golden brown and filling appears firm. 7. Cool completely, cut into bars, refrigerate. Generally, I don’t share every moment of my personal life … don’t want to be guilty of providing TMI. My life is like everyone else’s … good and bad, happy and sad, exciting at times and boring sometimes! There is a lemon tree in my backyard … those aren’t always the lemons in my life. Please don’t take it wrong … don’t want to sound like a “negative Nelly” … good things have happened, too! I’ve been blogging for a little over four years now and my hubby, The Peanut Butter Man, has been hospitalized four times during that time … once planned for ankle surgery, three times not planned. Shortly after Easter this year, I called 911 and he was transported to the closest hospital. He was dehydrated and had internal bleeding in the digestive tract. He was home in just a few days and is fine today (the nagging wife reminds him to drink water 😉 ) I admit, it was frightening and life threw us a curve ball … glad it’s over. On a happier note … our nephew just got married … made the wedding cake and groom’s cake. 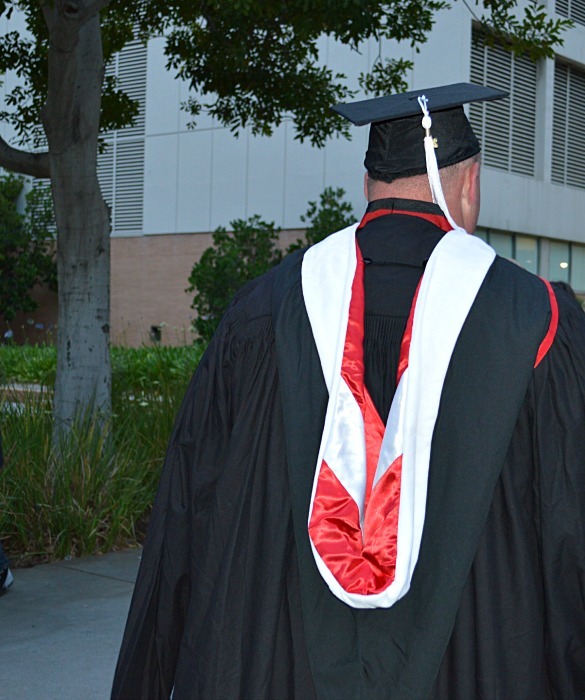 The lovely ceremony and reception took place at the Los Angeles County Arboretum … beautiful place to visit! The hubby and I bought a new (to us) trailer for camping! It was a quite a job finding the right trailer at the right price … traveled from Orange County to Santa Barbara … OK, driving along the beach wasn’t too hard to handle 😉 We were just about ready to give up searching and found one about five miles from home … perfect trailer at a perfect price! I love our vintage trailer, but this one has a bathroom … big plus in the middle of the night! We are going camping with the new trailer tomorrow in Temecula, about three hours away from home. The reason for going to Temecula is that I am attending Bloggy Boot Camp! This will be my first “in person” blogging conference! I am so excited to learn new things … walking away with new knowledge, new friends and being re-energized! Are you going??? My girl friends and I made our annual trip to Big Bear Lake … tried out new recipes and ate too much, as usual. I’ll be sharing a few new recipes very shortly. The weather was great for a hike and picnic … drinks and appetizers around the fire pit, too! oh Brenda it’s good to have you back and i can totally relate to life being crazy busy that blogging has to take a step back! i’m not one to share a lot about my private life either but what i did learn from you is that being positive about the lemons in your life makes it all the more sweeter 🙂 you take care of yourself and know there are people like me who appreciate all that you do to share the gifts that you have! now i just have to get me some lemon curd and start baking these babies! oh and congrats to your third son that’s way awesome :>D! I’m was happy to see a new post from you, but totally understand that blogging comes second to family and life. I’m so sorry to hear about your diagnosis, but you do seem to have a good attitude about it. I hope you continue to do well with the medication and that you can keep making cute treats. Have a blast at Bloggy Boot Camp. I do hope you write about your experience. I’d love to hear all about it. Thank you so much Beth 😉 I’m trying to have a good attitude … it’s frustrating, but it’s not going to stop me! BBC was awesome and very informative … will share more soon. Welcome back my dear. You where greatly missed. You take care and have a wonderful time at B.B.C. Thank you Colleen 🙂 I must admit the bars were pretty darn good … we love lemon! I had a great time at BBC … learned so much! Oh my goodness Brenda! I hope your hubby’s ankle gets better and your medicine works so you can do all your normal activities. I will keep you both all in my prayers. 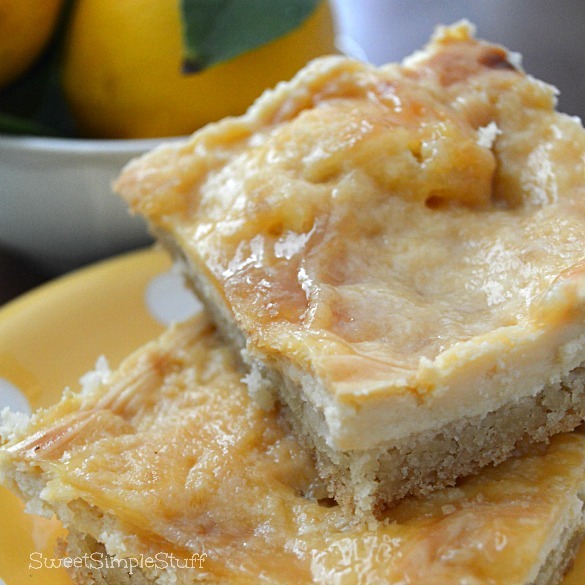 I can’t wait to make your lemon curd cheesecake bars! They look amazing! Thank you Lisa 🙂 We are doing well … just came home from camping … back to our normal crazy life! Hi Brenda! I’ve been stopping by occasionally, looking for a new post. Boy, was this one full of surprises! Where to start? Well, first off, your recipe is super. 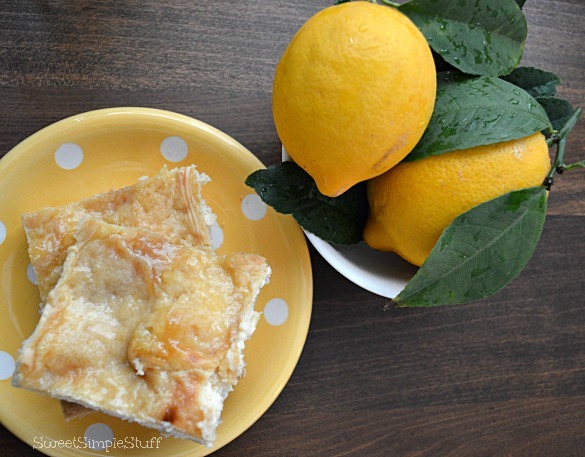 Any kind of lemon bar is a favorite of mine and this one is so simple. I’m sorry to hear that you and your husband have been having medical problems. Glad his is under control, and yours too. I was excited when you said we were going to see a picture of one of your boys. Then I laughed my head off when I saw what you actually posted. Surely #3 will forgive you that one picture. As a matter of fact, the others may want their pictures on the blog now. Hugs to you, dear friend, and pass one on to PB man, too.